The Phillies finished with an 80-82 record in 2018. We'll spare you a detailed recap of what transpired over the Phillies' last six weeks. Suffice to say, it was ugly. From first place to below .500, the Phillies showed who they really were as the dog days of summer dragged on, and despite increases in in-game attendance (17 percent) and wins on the year (14), the team somehow feels no closer to being a contender. Well, not to everyone. That feeling simply isn't true, general manager Matt Klentak said to the media earlier this week. "The last six weeks have been about as hard a professional six-week period as I have had," Klentak said. "It's been really hard. […] We live in a very binary world, where it's either black or white, good or bad, there's no in between. The reality of this season is, for four months, we were a much improved team, having a lot of fun, winning a lot of baseball games, doing a lot of things well. "For two months the air came out of the balloon and we were not good at all, and it was not fun at all. Both of those things are true. We don't have to look back at 2018 as being a good season or a bad season. [...] We made incredible strides on the pitching side of things, we won 14 more games, we exceeded preseason expectations." It's true. Very few, if any, baseball experts picked the Phils to finish above .500 (they wound up 80-82) with many picking them to finish fourth in the division. After being in first for much of the summer they eventually finished in third, just behind the Nationals. Expectations will be higher next season. How can the Phillies get better? It all falls on Klentak and Phillies president Andy McPhail. Bryce Harper. Manny Machado. Bryce Harper. Manny Machado. This is the mantra of the Phillies fan heading into what is sure to be a rumor-fulled and eventful fall and winter. The two franchise-changing players are both slated to hit the open market when the 2018 season ends, and have each been tied to the offensively-challenged Phillies, who are flush with TV money to spend. Despite the duo of sluggers seeming like can't-miss stars (Machado has 175 homers, a .282 career batting average over 7 seasons; Harper has 184 homers and a .279 average over the same span), the Phillies seem to feel a little burned by free agency of late. "It was a good cautionary message for the offseason," Klentak said, "that the best investment to make is not always free agency." One way to describe the Phillies haul of 2018 free agents after their first, expensive year in Philly? Average. Santana had a good on base percentage, but had issues with hitting for average (obviously) and blocked Rhys Hoskins from his natural position at first base. Arrieta pitched like a bottom-of-the-rotation starter, not an ace earning $25 million. And though Klentak was quick to point out that the Phillies had the fourth most productive free agent signings, based on total WAR from the regular season, the team knows it must be cautious not to burn more money on average players. The organization also doesn't want to get ahead of itself. "If you were going to invest all you had on one star-type player, then that would be sort of an acknowledgement that you think you may be one player away," MacPhail said. "There's always going to be that push for, 'Sign this guy, sign that guy.' Is that really going to solve the problems that I articulated earlier -- the defense, playing within our division better, being more consistent, striking out less? I mean, those are all things we're going to have to balance this offseason." Manager Gabe Kapler, who will return in 2019 despite his critics, had a controversial and sometimes confusing season at the helm of a big league club for the first time. The conversation this offseason will be centered not on Kapler's managerial decisions, but on the proper make up of the team. There are a lot of talented players on the Phillies' roster but just nine spots on the field. Getting the right player in the right spot at the right time is something the team needs to work hard to figure out. As mentioned before, getting Hoskins back to first base would be a smart move. So would figuring out the rest of the infield. Will Cesar Hernandez be traded to open second base up for Scott Kingery, who's inked to a long-term deal? Is Maikel Franco staying at third, or will Carlos Santana assume that position? Who is the starting short stop? And the team has moving parts in the outfield as well. Roman Quinn appears to have arrived, but what does that mean for Odubel Herrera? The Phillies would surely be more open to bringing in a big name free agent if they had confidence on the players who were already here. 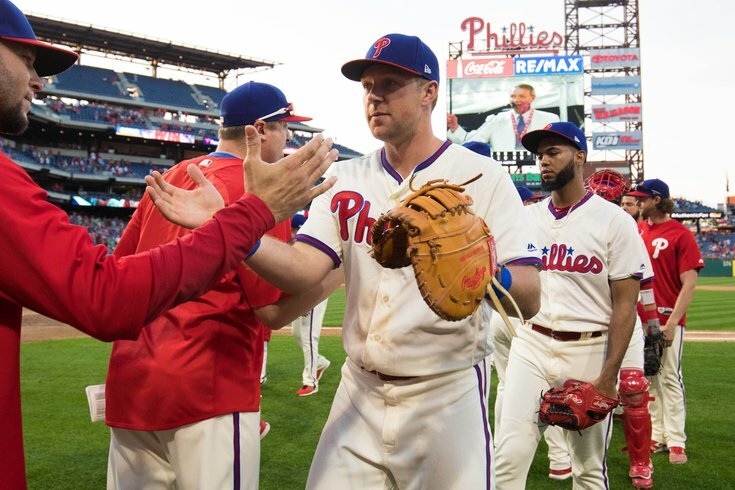 Klentak suggests that a large part of the team's short-term success will come from the players seen in Citizens Bank Park last year. "We know that this club needs to improve," Klentak said. "We aren't going to go back to that same 40-man roster we finished the season with. I think there will be some changes. [...] The next step for this franchise will be driven by a couple of things. Number one, players we might acquire from outside via trades or free agency. That's only one. I think the other is the growth and development of the players we currently have." The Phillies' top prospects got hot toward the end of the year, and it's possible that their first round bats Mickey Moniak, Adam Haseley, Cornelius Randolph and 2018 pick Alec Bohm will make big steps forward next season. The team needs to hit on at least one of those picks — meaning see one of them emerge as an every day big leaguer — if they want to somewhat justify recent tanking seasons. "Sometimes the most important thing you can do in a rebuild is to let it happen," Klentak said. Everything above might have you down on the Phils, but you shouldn't be. There are some important pieces in place. "We definitely got some answers this year," Klentak said. "Aaron Nola, he's turned into an ace. I think we are watching Jorge Alfaro turn into a gifted defensive catcher, we are watching Rhys Hoskins turn into not only an offensive force but also a clubhouse leader. "We aren't the first organization to have a group of 24, 25 or 26 years olds go out there and show flashes of growth but also struggles. I look at the teams that preceded the great run from 2007 to 2011." Is Nola the next Cole Hamels? Is Hoskins the next Ryan Howard? Can Kingery get consistent enough to follow Chase Utley? Will Seranthony Dominguez prove to be a more powerful version of closer Brade Lidge? Can Quinn start things off like Shane Victorino did? And most importantly, will the front office know which buttons to press, which free agents to sign, and which prospects to bring up and when? The 2018 offseason could be the most consequential for the franchise in nearly a decade, and the team must get it right.